Faber Industrie Spa are world leading manufacturers of steel cylinders. 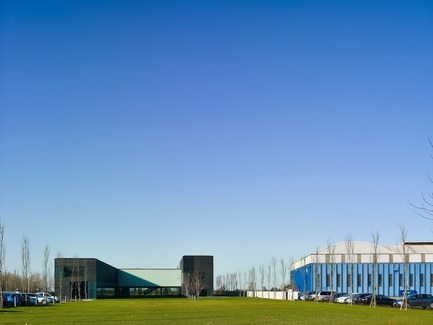 Their new headquarters are located at a boundary between an industrial area and farmland, and hence belong to both, the industrial and the natural landscape. 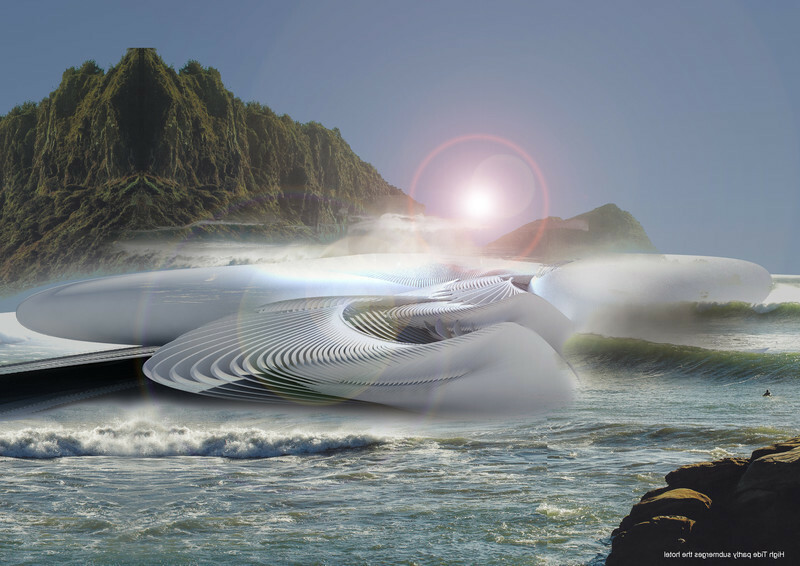 The aim of the project is to interface both landscapes and acknowledge their different qualities and values. 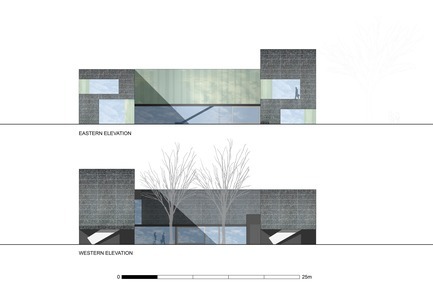 The volume of the building is designed to “bring the two landscapes inside”, and integrate them in the new spaces. 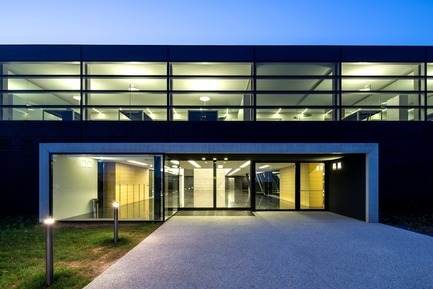 The building consists of two shifted longitudinal volumes linked by an entrance hall. 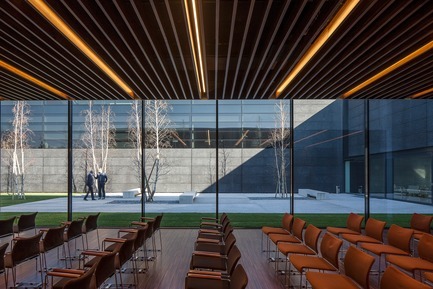 As a result, two “internal” open spaces are created, and controlled by views over the building and over the two landscapes. 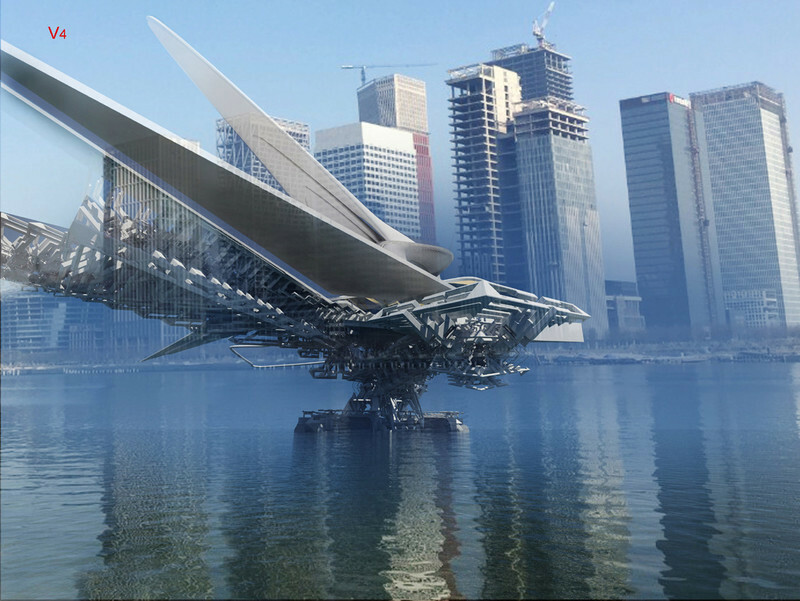 The designers here worked to obtain a reduced scale, i.e. the human scale, as opposed to the large-scale industrial area. 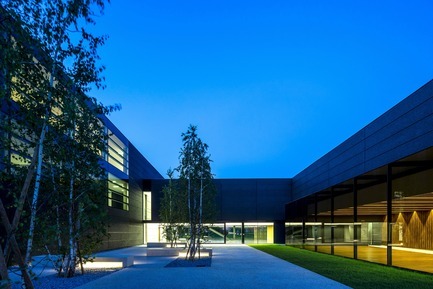 While one courtyard is “hard”, lined with trees and conceived as a living area, the other courtyard is “soft”, entirely green and free, with an open visual depth eastwards, facing the manufacturing facilities and the mountains towards the Slovenian border. The notion of “double” is mirrored in the section, that is two “S” shapes. 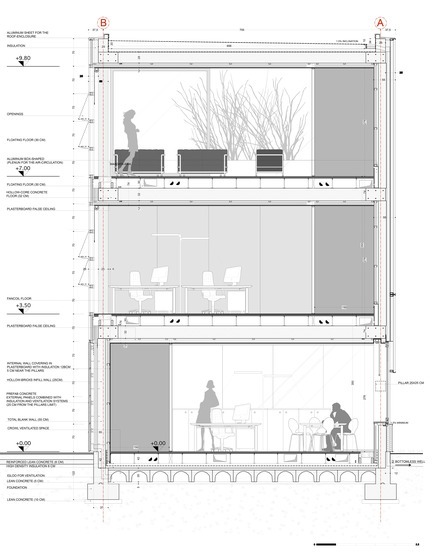 The corridor/office plan is inverted on the two levels: one totally blind side and one totally open side are overlapped, giving way to radically shifting open/closed fronts. 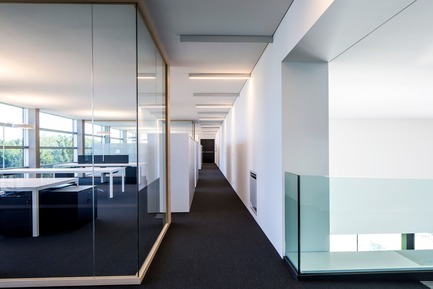 The eastern head fronts of the office bodies actually highlight the S-section, while the western head fronts, where fire-exit stairs are accommodated inside wall panels, are closed and silent. 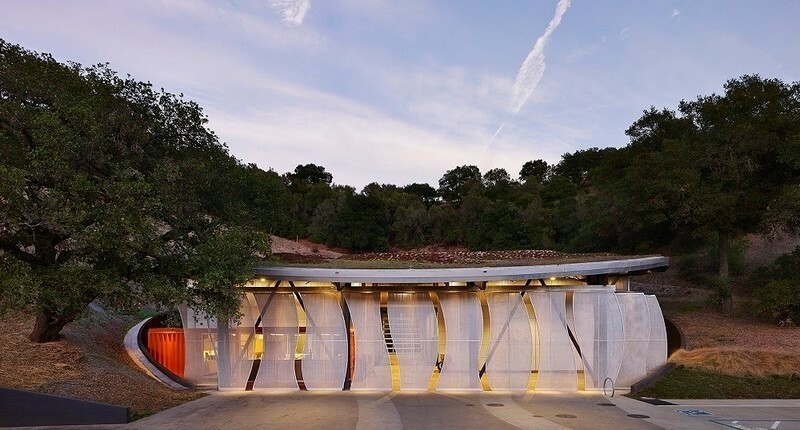 The notion of “double” permeates the whole design process, including the façade design. 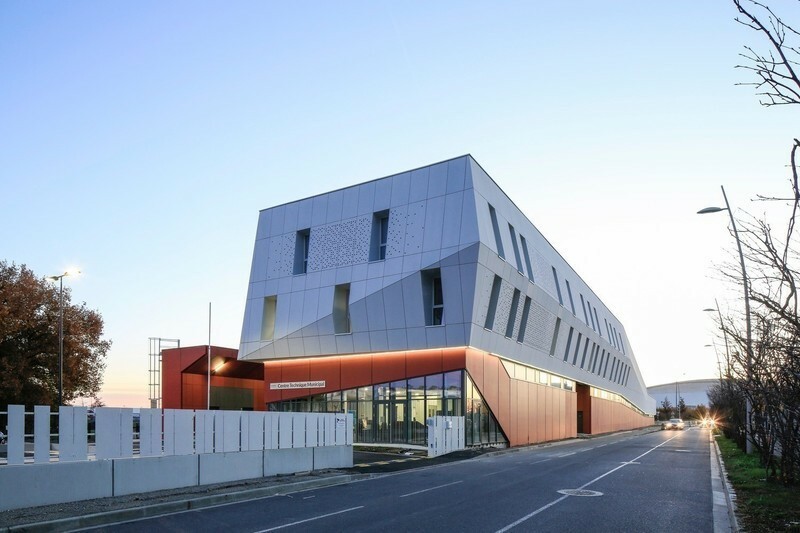 The building is covered in a ventilated “skin” made of two materials, i.e. 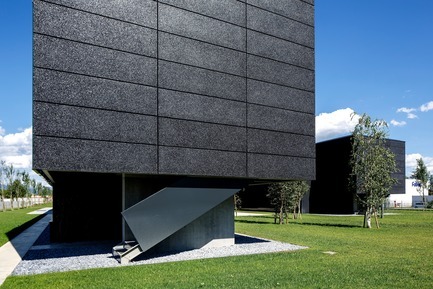 black concrete and black glass. 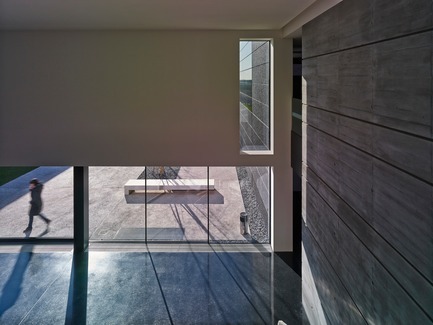 The prefabricated concrete walls and the glazed front cells alike are horizontal, 4 meters wide and 70 centimeters high. All elements are connected with the same method, i.e. 20 millimeters wide open joints. 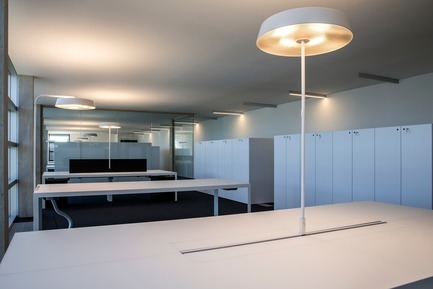 This gap element governs all installations of the front parts, groundline and skyline, horizontal and vertical separations, change in materials, and corner solutions. 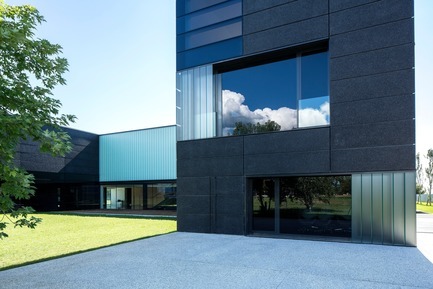 The black skin of Faber building is a product of the designers’ research on abstraction. 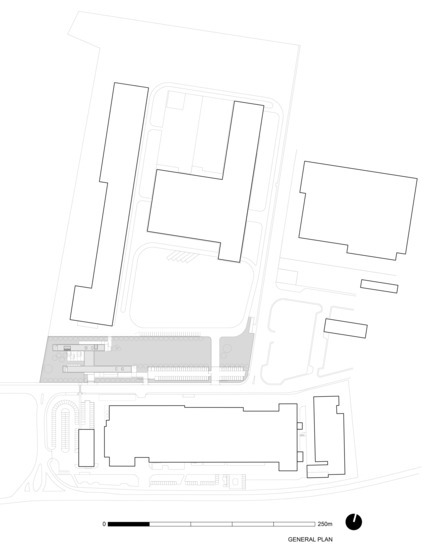 Although the building is about 100 meters long, it looks “small” as compared to other huge industrial plants. 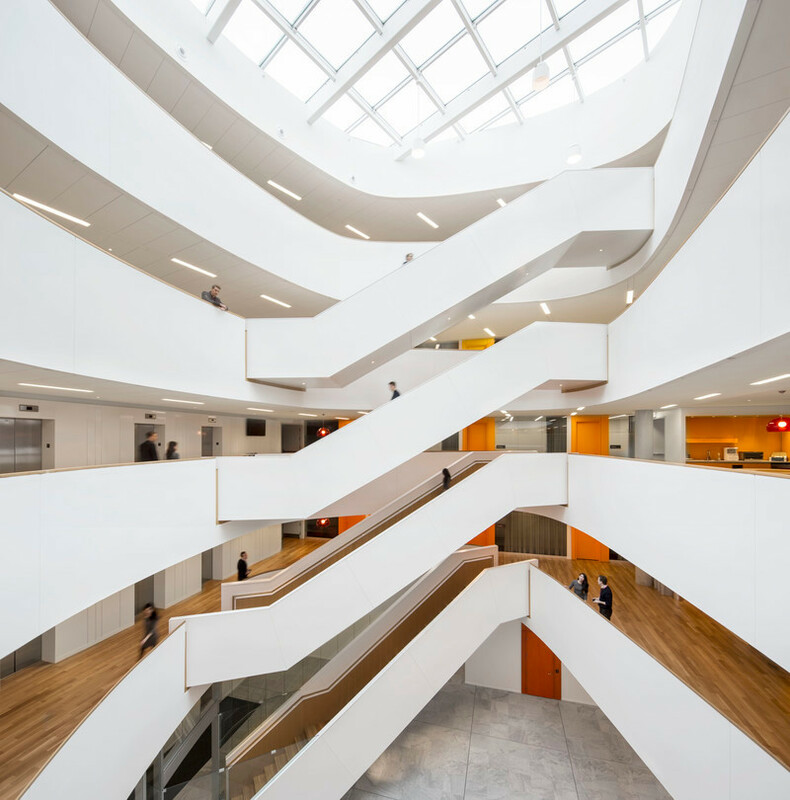 Thanks to the subtle nuances created by four different types of glass and five different types of concrete, the building maintains the rigorous shape and layout of an industrial facility. 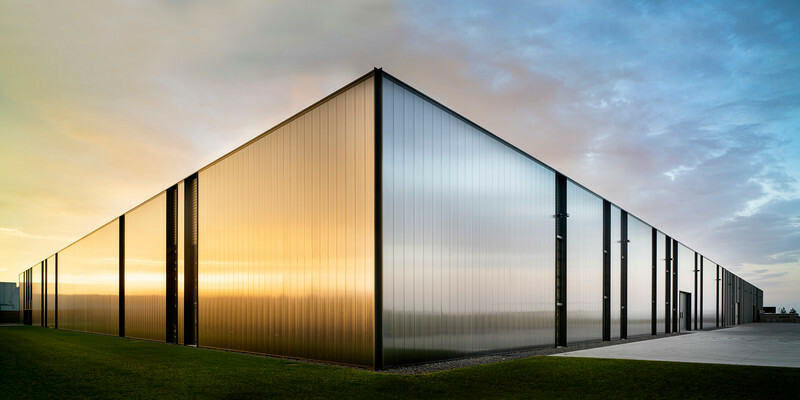 Then, it will not stand out from the context because of its shape, but only because of the lightness generated by one color getting degraded as it relates with the surrounding grass, tarmac, manufacturing plants, the sky and the people. 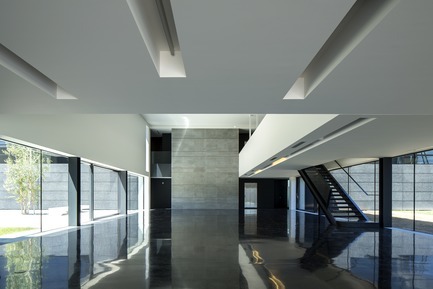 Black concrete is also the main feature of the most important area inside the building: the entrance hall has a large black-on-black terrazzo floor, a “liquid” element helping mirror and connect the two green courtyards together. The new headquarters cover an area of about 2,800 square meters above the ground, and of about 1,400 square meters underground. They consist of two longitudinal volumes, oriented east to west, with an overall width of 7.80 meters, and different heights and lengths. 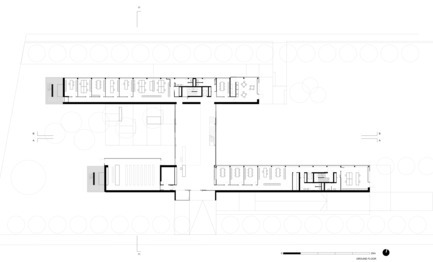 The two blocks merge through a central volume serving as hall/reception, waiting area and functional connection of all areas. 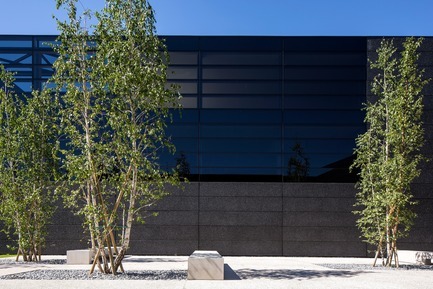 All open spaces are lined with hedgerows of black poplars, which serve as standing “landmarks” to match the front wall panels. 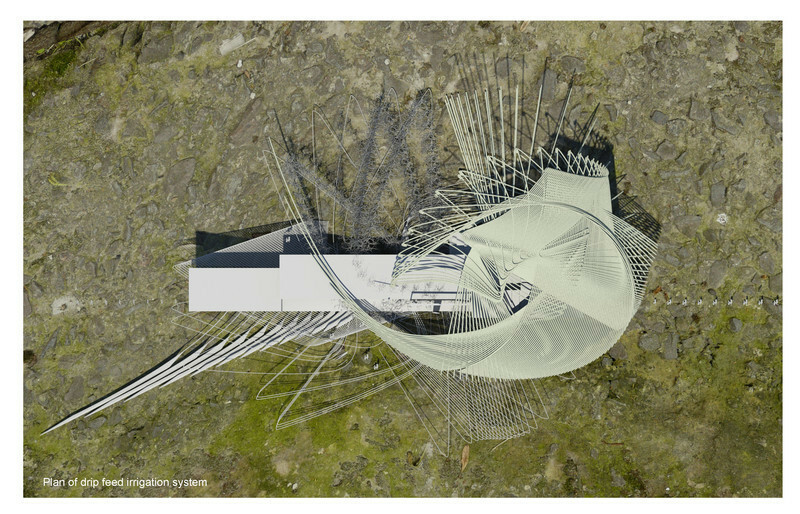 The hedgerow contour alternatively moves towards the inner or outer boundary of the area to hide the car park or highlight the perspective views. 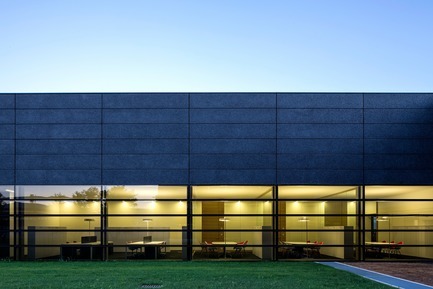 Stefano Gri and Piero Zucchi founded the practice GEZA - Gri e Zucchi Architetti Associati in Udine in 1999. GEZA is based in Udine (Italy) and it works in partnership with MTD - Marc Thorpe Design (New York) and CFK Architetti (Venezia). 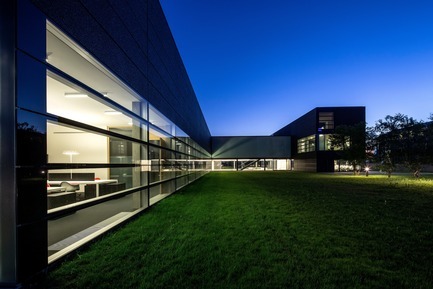 The most important projects completed recently are Faber Headquarters (2013, Cividale del Friuli, Udine), Pratic Headquarters and Production Complex (2011, Fagagna - Udine) and House of music (2010, Cervignano del Friuli - Udine). In 2015, GEZA was awarded with Architetto Italiano 2015 (Special Jury Award) announced by the Italian Council of Architects. 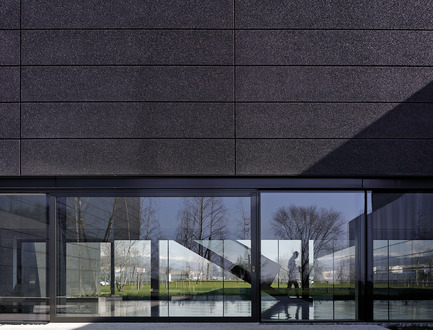 In 2012, Pratic Headquarters and Production Complex won the private client category, announced by the Triennale of Milan. 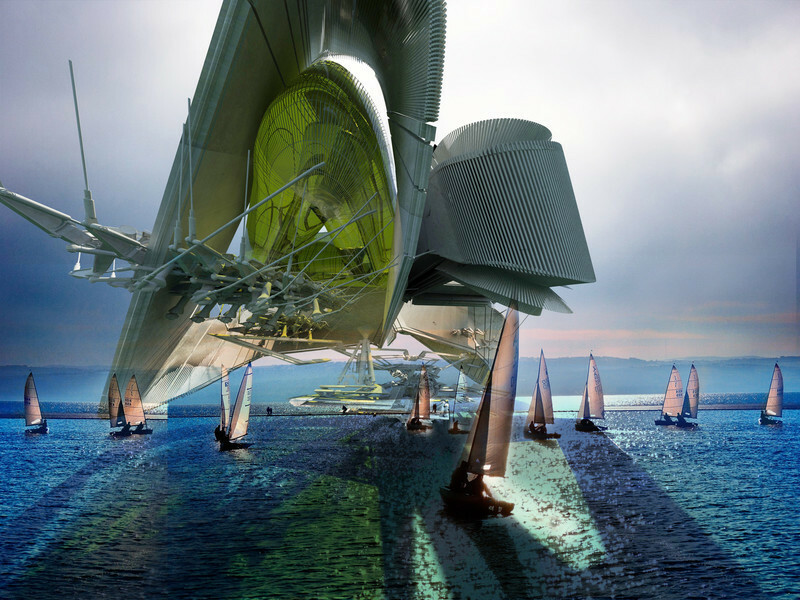 The same project was presented at the XIII Biennale of Architecture of Venice in the Padiglione Italia “Made in Italy”.